In 2001, a devastating earthquake wiped Gujarat and its people of their lives and livelihoods. People lost members of their families, livestock and produce. In the aftermath of this natural disaster, SEWA was involved in helping communities rebuild their lives. During this time there were community discussions on critical issues of preservation. The idea of a community centre came about to serve as a repository of knowledge and resources. People valued tradition – the arts, games, sports, music, farming, dairying and tending to their animals. The loss of tradition was the first thing that was perceived as a threat in the event of a natural disaster. People in Gujarat felt that the process of rebuilding what communities had lost in the earthquake involved physical and material rehabilitation. Without these two critical processes, local knowledge, folklore, and the arts could be lost forever. A Community Learning Centre (CLC), to house the above-mentioned elements, was considered to be the best way to create a bond among communities. The first CLC project was initiated to serve as a hub for traditional knowledge and livelihood support for around 15 villages. Each village was comprised of between 500 and 800 households. CLCs were also designed to serve as the core of community disaster preparedness strategies. The Centres were used as a facility for planning, administration, and equipment storage necessary for disaster strategies. Coordinating activities from one central location not only leads to efficiency, but also maintains SEWA’s commitment to local ownership and a holistic approach to community development. Community members are responsible for running the centres and deciding on the activities it facilitates. This process gives primary importance to local knowledge and decision-making. SEWA has played the role of an organiser in developing these centres, building capacity and providing training to ensure local leadership can sustain the centres on their own. Over time, the activities of the CLCs have expanded to include livelihood and business support for local communities. This new role of the centres has become particularly relevant in the current scenario where rural youth wish to equip themselves with skills to make them more employable in urban areas where the role of information technology has become important. CLCs have progressed technologically over time, initially providing link-ups via satellite providing educational courses, to having Internet connectivity. Young people flock to the CLCs to access information about job postings online and course availability. SEWA has facilitated the evolution of these centres by providing livelihood support, helping youth find employment, and undergo technical training necessary for success. CLCs in areas where the demand for vocational and livelihood support is particularly high, have now been upgraded as Community Learning and Business Resource Centres (CLBRC). Here, SEWA has helped forge linkages between the youth, local industry, and businesses to find jobs in the region. While this solves problems of unemployment, it also controls migration by enabling youth to find work locally. In offering these services, the CLBRC charges a small fee thus making it possible for the centres to become sustainable. 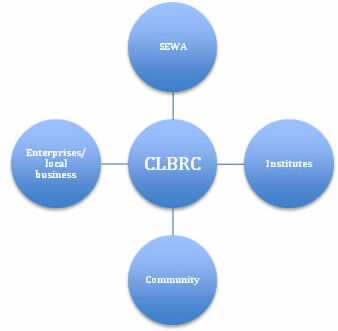 A Community Learning Business Resource Centre (CLBRC) is a community-owned, community-managed resource centre that enhances employment and livelihood activities of the rural poor.The goals of a CLBRC are to increase outreach of its services within a community and to help increase users income through technology. We are preserving and reviving traditions, as well as building and strengthening partnerships, such as public private partnerships, institutional linkages and linkages to government schemes. Currently SEWA has set up 15 CLBRCs in five Indian states. Before establishing a centre, a spearhead team from SEWA conducts a participatory rural appraisal in the villages to understand the needs and aspirations of the people. The team assesses the motives behind migration that compel people to leave their village or region. The centre that is established seeks to address the issue of migration and helps find solutions at a local level. Because of the contextualization, the centre becomes demand driven, need-based, and caters to a regions particular needs and community. The Visavdi CLBRC in Surendranagar addresses needs of salt farmers who live in the region. All of the activities at this centre are based on the needs of the community. After surveying four villages, the centre decided to add computer training, basic mobile training, mobile repair and hardwire repair. Training in the areas of agriculture, animal husbandry, ICT and sewing rely heavily on the participation and organization of the communities themselves. The backbone of the centre is its members. Through the CLBRC and their SEWA membership, many women have been able to secure loans to start their own micro-enterprises. Agriculture and Government schemes are important components that are implemented through most CLBRCs initiated by SEWA. Community Radio is used for awareness at all the centres. Most CLBRCs are upgraded CLCs that incorporates business development, enterprise support and employment for local communities. In addition, there are strong components that enable response to natural disasters and recovery post-disaster. These centres are utilized for various services ranging from nursery school to women using the space for livelihood activities. This information is used for local level development activities as well as for the village’s sarpanch (municipality), or local leaders. CLBRCs are ideal locations for community education events and seminars. Centres often have health care facilities providing community members with basic care along with a variety of workshops such as nutrition, hygiene, maternal and child health, and other primary care issues. In addition to health care, social issues such as women’s rights, gender relationships, are also discussed. Life skills activities such as Jeevan Shala—SEWA’s school for life-skills and literacy programs are also conducted in CLBRCs. Skill training for livelihood cooperatives is conducted in the centres. Gum collectors and salt farmers store their products at the centres then facilitate product transportation to distribution facilities. Embroidery cooperatives collect their raw materials from the centres and once their work is complete, return with their finished products to the centres for inspection and distribution. The centres often house materials and final products of the livelihood cooperatives. With RUDI or direct procurement and marketing of essential commodities becoming a source of livelihood for many SEWA members, these centres have also become RUDI procurement and processing centres. The earthquake made community members realise the importance of financial services such as savings and insurance. Savings schemes are an effective way for families to mitigate disaster through their own efforts. Furthermore, a variety of insurance products, such as life, health, disability, and property insurance, can help families develop a livelihood in a disaster-prone region. They can also protect family members in case of a death or debilitation of a primary wage earner during a disaster. Given their importance for reducing household vulnerability, the provision of financial services is an integral component of the disaster preparedness strategies. CLBRCs administer all accounting including saving deposits and insurance premiums and record keeping services for their community members. Most villages where SEWA works are in very remote, semi-desert areas. Due to the isolation areas, it makes these villages difficult to access in case of an emergency. These teams are responsible for assisting their communities in the development of contingency plans to cope with possible disasters. Such plans include whom to contact in times of an emergency, information on households, insurance and damage assessment procedures. The centres provide basic emergency equipment and tools necessary for disaster response and recovery. Animal husbandry is one of the primary occupations in this semi-arid region. For the most vulnerable families in a community, livestock is an important asset that may offer financial security during and after a disaster. A secure, regular supply of fodder is the only way to check mass migration, especially during natural disasters. Regular fodder supply is also essential to run dairy cooperatives that provide income and nutrition to many families in the region. Therefore, fodder banks are an essential component of the disaster preparedness strategies in order to mitigate the effects of disasters on community members, or to prevent widespread economic loss. Depending on the space available, these banks are also housed in the Community Learning Centres. The banks collect and store fodder beforehand to ensure a regular supply throughout the year. Traditionally, families would store excess grain in earthen pots buried in the earth. This would provide them with nutrition security in times of a drought or crop failure. During droughts or low harvest, the grain is available as a loan for households in need. With this bank, communities have access to food throughout the year. The bank is administered and managed by the local people to ensure local decision-making and control. As CLCs have evolved into business resource centres, they also house tools and equipment libraries that can be used by farmers, salt workers and other agricultural labourers. This initiative was piloted in Surendranagar and found to be extremely relevant and worth taking to scale. The film clubs show movies with social messages, a popular way to draw crowds and keep the community mobilised. The centres have a distinct recreational purpose to increase outreach and membership. There is an E-library for children for educational purposes with CDs along with a library to revive traditions, etc. SEWA has ventured into community radio, ran from CLBRCs. Owned and managed by the community, this tool is used to pass important messages and advertise local businesses thus generating income for the centre. Most importantly, keep traditional art forms such as songs and music alive by promoting performance of local artists on radio. With the CLBRCs, people can receive information on weather, price of commodities and trainings on agriculture, health and education. Some centres are connected via satellite with specialists such as scientists, doctors and professors to conduct classes or respond to inquiries remotely with the community. With rural youth aspiring for higher education and better jobs, these centres provide support through IT to enhance and develop skills and preparation for competitive examinations. IT provides the most sustainable business model for a CLBRC where people can learn to use the internet and computer to improve their lives. A CLBRC is typically set up with community participation and contribution – either resources or labour – that enhances ownership. However, to provide the centre with equipment and technology requires investment and partnership. A critical link with the government has enabled these centres to become the focal point for promoting government schemes and activities at the local level – health, education, nutrition and livelihoods. Government representatives use CLBRCs as a site for providing information and reaching out to communities effectively. Other than tapping government resources, there is also tremendous potential for leveraging support from the private sector especially in providing skill-based training to improve employment opportunities for local youth. Partnerships with local institutions have enhanced skills and capacities of local youth, as well as farmers and other producers. In supporting local micro-enterprises, the centre offers low-cost technologies and provides a site to sell local produce and commodities at nominal rents. These models provide different avenues of making the centre economically viable and vibrant. SEWA facilitates these interactions and plays the critical role of organising communities around issues pertaining to livelihoods and interests. They can use their collective strength to achieve maximum benefit and support. In the Bodeli CLBRC, SMS has piloted the use of satellite data and its utilization by villagers. Earth observation from satellite data have been primarily used for creating natural resources database repository comprising of various thematic layers like land use, soil, water, forest, and geology. The Bodeli cluster was taken as a pilot study in order to understand the work elements involved in remote sensing. It is for the first time in Gujarat that this data is being used by village farmers at large and also those selected farmers provided with a Soil Health Card (SHC) number and information on pH, EC, N, P and K status of their fields. This information will help the farmers to manage and plan crops they are sowing in their fields. The average value of the soil properties for the villages was calculated from the individual field observations available from SHC report. The integrated GIS databases of thematic layers, topographic layers and administrative boundaries are created for all the villages covered under Bodeli VRC cluster. The GIS databases have been integrated with customized Garmin software for facilitating display, query, browsing, and overlay. The integrated system has beeninstalled at the Bodeli VRC location. This NRM system will help the villagers in planning and implementation of various Government sponsored programs, both collectively at village level and the individual at parcel level. The valuable information gathered from thisCentre very useful to the farmers as the weather and price information help the farmers make the farming activity sustainable. In the pilot cluster, ISRO, and Anand Agriculture University have provided their support to the CLBRC.Satellite images for this cluster are given to at free of cost. The services of Anand Agriculture Universities to get the soil health card information have also been engaged in the project. The CLBRC at Pij in Anand/Kheda district houses the village resource centre services in partnership with Indian Space Research Organization (ISRO). SMS and ISRO partnership work towards providing state of the art technology; V-Sat, satellite modem, UPS for the modem, Ext. C band antenna at CLC, Expert Centers, similar to Apollo Hospital, Wagad Hospital,Anand Agriculture University for telemedicine and tele-NRM trainings.TheCentre provides the community members and their organizations software and hardware training as well as Internet access for the development of their small enterprises.Rural membersthat are associated with various labour activities like agricultural, weaving, and construction work face many physical and health related problems; therefore, SEWA Health care provides them heath education, immunization, training for family planning, referral care, health insurance service, ayurvedic treatment, and other health services. SEWA also provides low cost standard quality medicines which are providedfrom theCenter Along with these services, health care services through Tele-medicine is also being provided. This CLBRC is also equipped with x-ray and ECG machine for the benefit of the villagers. PijCentre is the nodal place for activities like saving, credit, and insurance. The training opportunities on formation of Self-help Group (SHG), its importance, management, activities, and the integrated approach are provided in theCentre.